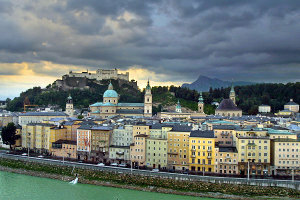 Description: Deutsch: Panoramablick vom Kapuzinerberg auf die Salzburger Altstadt, an der Salzach entlang der Rudolfskai. Licensing: Permission is granted to copy, distribute and/or modify this document under the terms of the GNU Free Documentation License, Version 1.2 or any later version published by the Free Software Foundation; with no Invariant Sections, no Front-Cover Texts, and no Back-Cover Texts. A copy of the license is included in the section entitled GNU Free Documentation License.